You can use a concept map to map out your ideas or to explore and present the connections in your data. Use shapes and connectors to visualize the evolution of your ideas and theories. A concept map is a free-form visualization made up of different shapes and connectors. Identify a list of related concepts. Put them on shapes and move them around the canvas to get a sense of grouping and order. What else might be associated with them? Add additional items. Connect each concept to show associations. Take something you've already written and try to map it. Try visualizing how you see a case. Add different shapes to the map to represent what impacts or is impacted by the case. 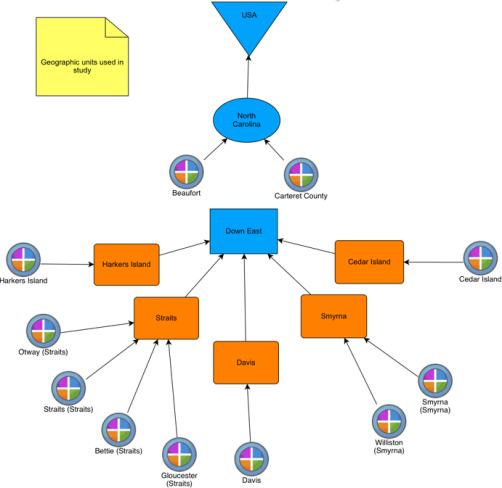 You can add project items to concept maps to help build your diagram. Your map doesn't have to be complete to start with. As you gather data, add project items to your concept map to flesh out your visualization and help you with your analysis. A good way to see if you are on track is to have colleagues check your diagram—can they interpret it? When you create concept maps, save an image in your project journal and record your observations and insights. When should I create a concept map? Create a diagram of the concepts, connections and patterns you expect to find. Show your planned action and the expected results. Divide variables that are conceptually or fundamentally distinct. See if there are conflicts. What are you struggling to place? Draw possible links between concepts. Confirm you have data to support every linkage you have drawn. Establish a sequence of consequential steps. Ask what had to come before or what followed after each step. Visualize theoretical connections in your data. Show things that had to be in place for an outcome to occur. Condense all that you have learned into a restricted space and identify what's important in what you have found. Convey information whilst saving word count for results. Record theoretical groups of the categories and concepts contained in your research question. Sketch the relative locations of sites, events or people in your project, as observed by yourself or described by others. Demonstrate your theory about a pattern or pathway. Sum up the key elements of a process you have identified. Draw a timeline to show historical development of a situation or sequence of events. Map the logic used by a participant for the decisions they've made. To make changes to a concept map, make sure you are in edit mode. Click the Edit option at the top of Detail View. 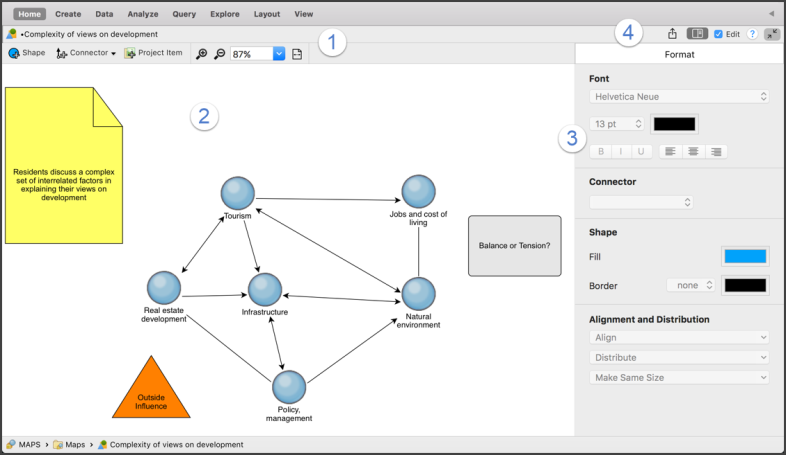 1Add shapes, connectors or project items to the Concept map. Project items are shapes representing existing project data. For example, add two cases from your project and draw a connector to show the association between them. Open a case to see all the coded content. You can also drag and drop from List View to add project items to the canvas. 2Drag shapes to move them around the canvas. You can zoom in or out using the magnifying glasses at the top of Detail View and use the horizontal and vertical scroll bars to move around the map. 3Use the Format panel to set the way selected shapes or connectors are displayed. 4Choose options for sharing, editing and expanding the concept map. You can also hide the Format panel. Hover over each option to see a description. TIP To make more room when you're working with maps, click the Expand icon on the top right of Detail View to display the concept map in full screen. On the Explore tab, in the Visualizations group, click Concept Map. In the Name box, enter a name for the mind map. Click the Shapes button and choose a shape. Add project items to the map by clicking and dragging from List View. Click Connector and choose a connector type. Click and drag from one shape or project item to another. An arrow connects the shapes in the direction you dragged. Double-click in a shape to edit the text. Make sure you are in edit mode. On the left, click the folder name that contains the project item you want to add. On the right, select the check boxes for the project items you want to add to the map. Select the Attribute or Attribute Value you want to add and click Select. You can use keyboard shortcuts to work with maps. If you want to change a map, you must be in edit mode. Click the Edit option at the top of Detail View. Project Items are not live to the data—for example, if you rename an item in your project, the update is not reflected in the map. If you delete a project item from the concept map, it is removed from the map but remains in the project.